So you have your new eWON unit, and you're all set to have it registered and connected to Talk2M. However, you are faced with a choice: You must choose the type of account to register with, either Talk2M Free+ or Talk2M Pro. You may ask, "What's the difference, and how do I know what's best for my organization?" In this post, we will shed some light on the key differences in order to help you make the right choice. Talk2M is a provider-hosted VPN service used to establish connectivity between remote users and their eWON units. With either Talk2M option, Free+ or Pro, you must register each of your eWON units to a Talk2M account. Users: Both services allow you an unlimited number of machines and users so there is no need to worry about how many units you purchase or how many users will need access to this service. The added value of Talk2M Pro is it allows multiple concurrent connections for multiple users to simultaneously log into one account with eCatcher and connect to different eWON units. 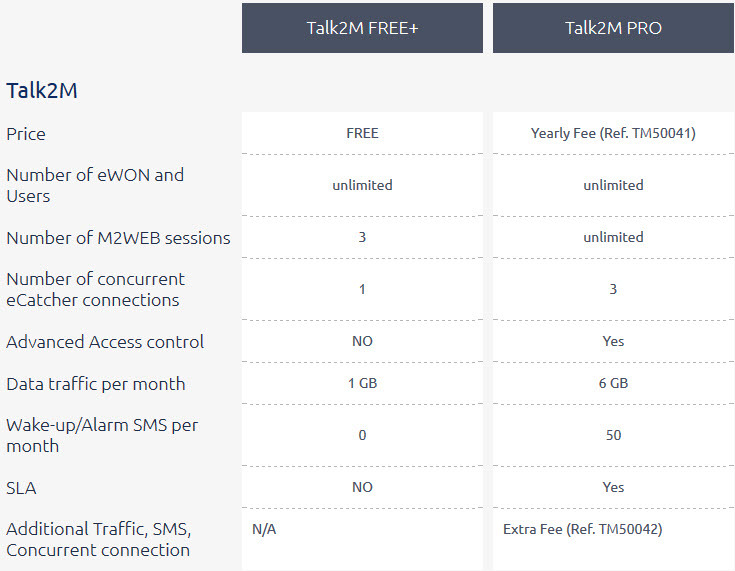 This includes access control, which lets the administrator of the Talk2M account determine which users have access to not only Talk2M, but also to various eWON units. Reporting: Both services provide connection reporting, which allows you to see who has been connecting to the Talk2M service and for how long. Notifications: Both services provide SMS and e-mail relay for alarming. This means your eWON unit can send out notifications via text message or e-mail when a fault or outage occurs with your machines. For all of its additional features, the Pro service comes with a small annual fee. If you're considering a Talk2M Pro account, please contact us to receive a quote. Reference the chart below for a comprehensive side-by-side comparison of Free+ vs. Pro.